Papé, Frank C. Illustration from Cabell's Jurgen. [London, 1921]. 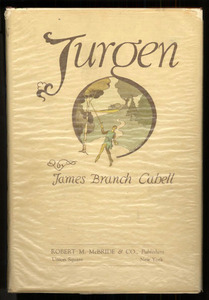 We recognize James Branch Cabell's Jurgen much more for the censorship debate surrounding the book's publication than its literary value. In 1922, the publishers of Jurgen faced charges for publishing an "obscene" book; however, like James Joyce's Ulysses, published that same year, Jurgen's "obscenity" stemmed more from its mockery of Anglo-American ideology than its sexual portrayals. 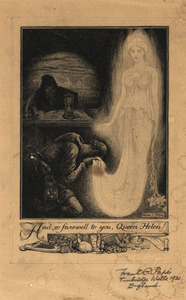 Especially troubling to the censors, Jurgen, an allegory, set in a mythical land, lampooned belief in the afterlife. The book's initial popularity attracted the interests of the censors, who ultimately were unable to suppress it. All items displayed in this section are from the Clifton Waller Barrett Library of American Literature. Cabell, James Branch. Jurgen, A Comedy of Justice. New York: McBride, 1919. 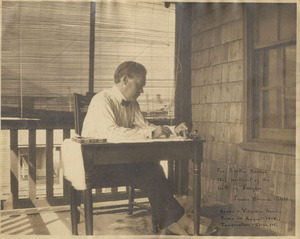 Photograph of James Branch Cabell inscribed to Burton Rascoe. Virginia Beach, August 1918. 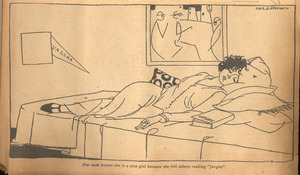 This cartoon from Cabell's own scrapbook shows a young woman asleep in her dorm room with the caption, "Her aunt knows she is a nice girl because she fell asleep reading Jurgen." Scrapbooks of James Branch Cabell 1 item.